Here is a shot of one of the aisles. One of many. The warehouse is about 85,000 square feet. That's big. That's a lot of books. Many cases which will be filled with books, then shipped out to schools for their Scholastic Book Fair (SBF for short). A small book fair might get five cases. A large book fair might get 24 cases. Here's a case, stocked and ready to go. A worker can stock 3.7 cases in an hour. I definitely could not work that fast. Even after a couple of explanations, I never really understood how you know which books go where in which cases. Please meet Mara, Scholastic Employee Extraordinaire. Mara undertands perfectly how you know which books go where in which cases. She is also very good natured about being accosted by geeky authors. Mara has actually stocked many cases with i so don't do mysteries. Part of the conveyer belt that carries the doodads (pencils, bookmarks, erasers, etc.) from this level down to the lower level. Joan and Lynne: Thank you for the beautiful engraved bookmark, the POUNDS of licorice for the road, the delicious Italian lunch, and the camarderie. It was a delight meeting the both of you. Oh, and can you guess the date of my visit to the Scholastic warehouse? Please check out the posts by the other My Town Monday participants by clicking here. If you have a MTM post, leave a comment on my blog or on the My Town Monday blog, and I'll add your link. Clair's busy today and asked me to do the link thing. Mr. Veiled Chameleon has been living in his own cage for a few months now. Is it divorce, reptile style? Not exactly. But it is a definite separation. Mrs. Veiled Chameleon had become ubermean, biting and hissing at the male whenever he tried to eat. As a result, Mr. Chameleon was thin and nervous. Anyway, Mr. Chameleon is now munching up a cricket storm and is, apparently, full of vim and vigor and an adventurous spirit. Here's what we found yesterday afternoon..
Mr. Chameleon in the back of a dusty toy closet, eyeing (with both eyes!) a sports car. He ventured about 14 feet from his cage. Vermont College of Fine Arts' Hunger Mountain journal is accepting entries for their annual Katherine Paterson Prize for Writing for Young Adult and Children contest. Click here for details. My very good friend, Maureen McGowan's, Switching Places, is a finalist in the Golden Heart! Maureen and I met online, only to discover she lives a couple of blocks away from one of my sisters in Toronto! Do I meet up with Maureen when I go back to the homeland for a visit? Uh, yes!! Maureen chatted with me about the premise of Switching Places a couple of years ago over a chicken Caesar salad. Great premise. Great writing. I wouldn't be at all surprised if she won. p.s. I have a My Town Monday post for Monday. Finally, I'm getting back in the swing of things. This past weekend was the Virginia Festival of the Book in Charlottesville, VA. That is one really fun book festival and one really cute town. I was on an author panel, chatting about setting. Yes, it's true; I'll talk about anything! Above is our fantastic panel: (back) Keri Mikulski, (who brought delish salt water taffy to share), me; (front) PJ Hoover (who is always uberfun and smiley), Stacy Nyikos (I just noticed she has an adorable new website) and Suzanne Morgan Williams, (who phoned me this morning at home BY MISTAKE!!). I like this photo of Suzanne Morgan Williams' arm, me and Keri Mikulski. This is the first time I met Keri IRL. She couldn't be nicer. I also met James of Book Chic. He has an interview with moi. What can I say about James? Entertaining. Friendly. A book lover. 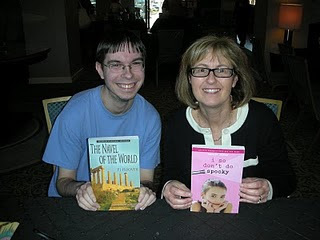 Here are myself and PJ Hoover with Susan of Wastepaper Prose. Susan's pretty wild and crazy and delightful. And she often has book giveaways on her blog. PJ said I squealed when I learned Susan's identity. Not true. I'm too cool to squeal. 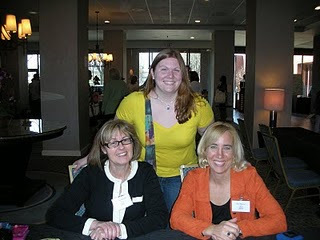 Following our author panel and other panels and an author reception where I chatted nonstop (who, moi?) with all sorts of people, I went out to "dinner". Yes, I placed quotation marks around dinner. Keep reading, and you'll see why. 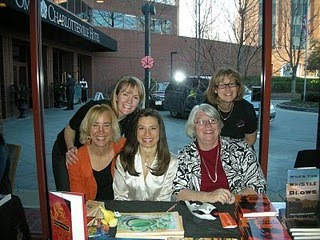 Here are a few of my "dinner" companions: Suzanne Morgan Williams, Stacy Nyikos and Irene Latham. I am SO glad Irene was there. She has an adorable Alabama accent which is easy on the ears. Even more important, SHE EATS LIKE A BIRD. You will see why the latter is important a little further down. This is my "dinner"!! It's tuna tartar. Well, what there is of it is tuna tartar!! Do you see the quarter? That's to give you some perspective. Three potato chips and a bite and a half of tuna. And it cost $13. A major apology to Suzanne Morgan Williams and Bonnie Doerr who copied me by ordering this excuse for a meal. A huge thank-you to Irene Latham who SHARED her steak and asparagus with me. All joking aside, it was a great weekend and a great book festival! And I have done a marvelous job with linking in this post, if I do say so myself. A quick update on Christina's Bone Marrow Donor Drive this past Sunday. Are you sitting down? Over TWO HUNDRED people showed up to do mouth swabs!!! In fact, the San Diego Blood Bank ran out of forms at Person #198! They ended up giving people a flyer with the info about registering online. Thank you to everyone who participated! To put all this in perspective, a drive usually gets 20 people. And about every 200 people will yield one match. Not necessarily for Christina, of course. But mostly likely Sunday's drive will help save someone's life. Wow! Here's a link for registering online FREE IN THE US UNTIL MARCH 28 and having a mouth swab kit sent to your house. Please pass on the word and the link. Oh, and here's a link to the TV coverage on Sunday. And while I'm going link crazy, here's a link to a review of i so don't do mysteries and an interview with moi by Mitch Wallace of the Sphagnum Patch. The review was in the March 2010 issue of the Mission Valley News and Views. Thanks, Mitch! A couple of years ago, Child #4 met a girl at school named K. Child #4 and K became very good friends. I met K's mother, Christina. Christina and I became very good friends, too. She has leukemia, and she needs an adult bone marrow donor. Desperately. As in, to help save her life. There is no match for Christina in any registry worldwide. But, maybe, just maybe, you're the match. How do you find out? A mouth swab. Christina is a 32-year-old San Diego wife and mom with Acute Lymphoblastic Leukemia. She has a ten-year-old daughter and a seven-year-old son. 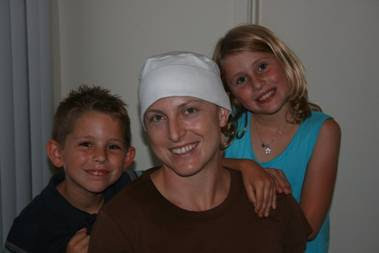 In July 2008, Christina was diagnosed with this rare blood cancer. Last year, she received a bone marrow transplant using umbilical cord stem cells. She was in remission for about six months. Then, in January, her cancer came back. Christina's best chance for survival is an adult bone marrow donor. The San Diego Blood Bank is sponsoring a drive this Sunday March 14 to find a donor. What: It's a mouth swab. Quick, painless, free. 8am-10am. Brooke Landau will broadcast her weather break segments from the bone marrow donor drive. She will interview Christina's husband and their children. Also, Christina will be watching from her hospital room. If you don't live in San Diego or if you do, but can't make it to the drive, you can still join the national registry and potentially help Christina or someone else. With the code below, it's free (normally it's $52) until March 28 (thank you Bone Marrow Foundation of San Diego). Click here to register for free. If that link doesn't work, Click here and, when prompted for promo code, type in: Christina. You'll receive a kit in the mail. You swab your mouth and send the kit back. And voila, you're registered. Please help find a bone marrow donor for Christina. Yes, it's kind of like looking for a needle in a haystack. Let's find that needle! If you're worried about what would actually happen should end up matching, Click here to debunk some myths about bone marrow donation. There are a couple of things I love about Monday. First off, everyone in my house trundles back to school or work after the weekend. I really look forward to a quiet morning of writing. Secondly, I enjoy posting these little My Town Mondays. I've learned a lot about San Diego County. Also, I enjoy reading others' posts of their environs. Please feel free to join in. If you do throw up a MTM post, let us know in the Comments section of the My Town Monday blog. Or even leave a message in my Comments section below. I have Admin privileges for the My Town Monday blog, and I'll hop over there to add your link. Okay. About San Diego. Did you know the jacaranda is our official urban tree? In Southern California, they bloom twice a year (fall and spring). This is unusual. Apparently, the springtime bloom is prettier. I've never noticed this, though. Kate Sessions (November 8, 1857 – March 24, 1940), a California botanist and horticulturalist, brought the jacaranda tree to San Diego. Ms. Sessions' nickname is "the Mother of Balboa Park." She planted hundreds of trees in the Park (cypress, pine, oaks, pepper trees and eucalyptus) from seeds from all over the world. 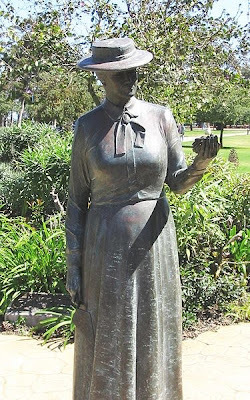 This is the statue of her in Balboa Park. We also have an elementary school and a park named after her. Phoenix, home to my thirteen year old fictional detective Sherry, has a lot of jacaranda trees. 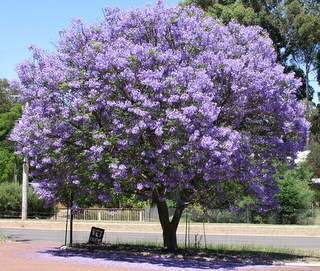 Pretoria, South Africa is known as the Jacaranda City because they have planted so many of the trees. In this city, the trees bloom at the same time as their end-of-the-year exams. There is a saying in Pretoria that if a jacaranda bloom falls on your head, you will pass all your finals. I think I'll drop a jacaranda bloom on Child #2's head before he takes his two AP (Advanced Placement) exams this spring. Oh wait! At the University of Queensland in Ipswich, Australia, students refer to the jacaranda tree as the "exam tree" or "purple panic." Here, superstition says if a jacaranda bloom falls on your head, you'll fail your exams. I guess I won't drop anything on Child #2's head! You can see we've renovated since the last Book Review Club meeting. So, pull up a new and comfier chair. Have a cup of coffee from our brand new espresso machine. And get ready for some exceptional book reviews this month. This is our FOURTEENTH get-together! We're happy you're joining us! No doubt you remember my delightful critique partner, Kathy Krevat. Basically, Kathy took pity on me and offered to write a review for this month's meeting. Most of you know I'm in the final push (we hope!) for finishing i so don't do famous, a book that may be renamed i so don't do endings!! THOSE WHO SAVE US by Jenna Blum is a beautifully written page turner of a book that raises many questions, some of them unanswerable. It is a Holocaust novel with a new slant – from the perspective of a German woman, Anna, who makes choices that reverberate into a new generation. I’m sure this book caused intense discussions in book clubs across the country, as it did in mine, about the ethical decisions people make: When it comes to survival for me and my family, what would I do? One woman pointed out the nasty things adults in our communities do to each other – gossip, leave people out, even humiliate people – in order to feel better about themselves. What would they do during a war? The opening chapter presents a huge question: why didn’t anyone attend the reception following the funeral of Anna’s husband, a World War II veteran and beloved neighbor of the small farming town of New Heidelberg, Minnesota? The book goes back and forth in time between Anna during World War II and fifty years later, when her adult daughter, Trudy, continues to deal with issues of identity and self worth. Anna has always been silent about the war while Trudy, a German history professor, wants answers. Anna, the beautiful daughter of low-level Nazi, is abused, but also seemed spoiled, and ultimately reckless, to me. The suspense builds right away when she begins a love affair with a Jewish doctor that ends tragically. Anna takes refuge in the home of the local baker, an unexpectedly heroic and enjoyable character. Soon Anna’s beauty catches the eye of a brutal Nazi officer and she must decide what is best for her child and their survival. Jenna Blum, who interviewed Holocaust survivors for Steven Spielberg’s Shoah Foundation, deftly weaves the horrific details of the Holocaust into what seemed like intimate and personal situations. This book continued to haunt me long after I finished it, mostly with the question: What would I do? Well, as you may have guessed, I did not hand in i so don't do famous as scheduled. This is why there wasn't a fancy dancy My Town Monday post waiting for you with your morning coffee. However, the week doesn't feel quite right when I don't post a MTM. So, I thought I'd throw up a short post. And sometimes it's a nice break to stumble upon a short post. Hopefully, this is a win-win situation today. -Ranger Smith often threatened to send Yogi Bear here as punishment for bad behavior at Yellowstone National Park. 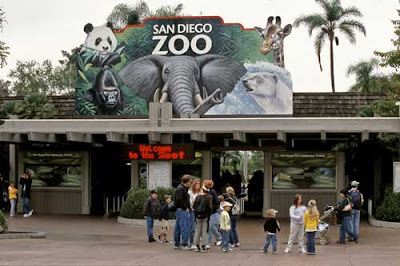 -Polar Bear Plunge (one of my favorite exhibits because the polar bear is my favorite animal) re-opens at the end of this month. I can't wait to see it! -Turtles, tortoises and terrapins are cousins to my beloved veiled chameleons. Because they're all reptiles. See. I told you. Short and sweet. I must admit, it does feel good to get this post up. Goodbye. I'm off to work on i so don't do famous. Thank goodness for a very kind and understanding editor. I really am lucky.